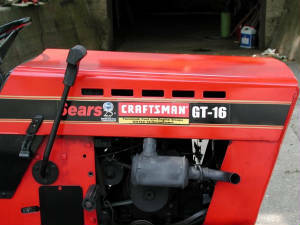 1979 Sears Craftsman garden tractor to it's near original condition. In February of 2004, a young 14 year old kid from the neighborhood (who we nicknamed "Bandito" due to his attitude and sly practices) thought he had a good scam going. 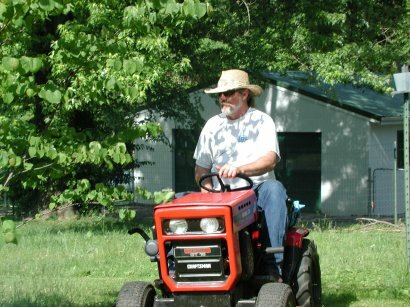 He had an old broken down riding lawnmower that he had conned his Uncle into helping him get up and running, but never had bothered to put the time or effort into putting it into a good state of repair, or even ever getting it to simply cut grass. He came up to me one day and asked me if I might be interested it. I looked it over and told him to get back with me. I checked out the brand, and manufacturer specs for it online in the mean-time. He wanted $225 for it, and I sort of hemm-hawed around contemplating things like acailability of parts and whether or not he had done any serious damage to it in the short time he had owned it. The next month I got hold of him, and told him to get his Dad to come up along with him and sign a bill of sale on it if he still wanted to get rid of it. I paid his asking price, and he really thought he had pulled one over on me. Unbeknownst to him, he had only scammed himself. 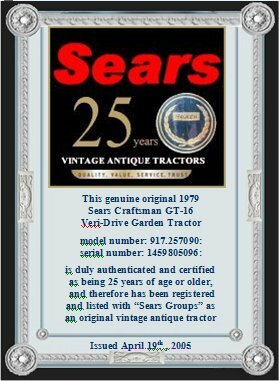 This was a true-to-life GT-16 1979 Sears and Roesbuck Craftsman series heavy duty garden tractor with cast iron, single cylinder 16 horsepower Tecumseh engine and even had a three point electric hitch to operate all types of gardening and implement attachments. It has a steel alloy 42" three-bladed cutting deck to boot. 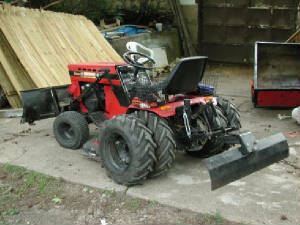 Not your little imitation putt-putt type riding lawnmower or even your more modern grass whacker 'zero-turn' aluminum block newbie’s, but a full fledged garden tractor that can run a plow, tiller, cultivator or harrow, and had 200lbs of lift capacity. 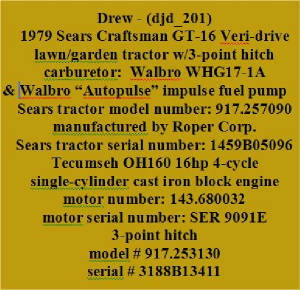 The following is data and information on the original tractor with specs, model and serial numbers. Tecumseh by Peerless and Roper companies in Feb of 79. The engine on this old girl is the winner of the outfit in that it is a single cylinder, cast iron block 16 horsepower overhead valved 4 cycle Tecumseh engine. Not much rating according to today's standards but believe me, this 3 & 1/2" bore 2 & 3/4" stroke single cylinder piston gives it a old timey 'thump-thump' shove that newer tractors can't even contemplate, and through the grapevine of the internet forum groups of collectors and techs, I’ve found that general opinion on these old motors is that they're bullet proof forever engines. A slight problem when trying to find 'new' aftermarket parts of course but there is still an availability of cross-over used parts in certain areas. 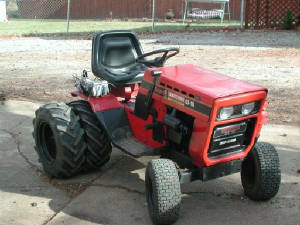 Other versions of this tractor by Sears are widely used up north not only for gardening, but also workhorse applications with snowblowers and grader/shovels, even front-side sickle-bar mowers. It can literary pull or push a full size pickup truck around in slow speed without even grunting. The engine system is almost identical to a regular car, just cut down to a single cylinder is all. 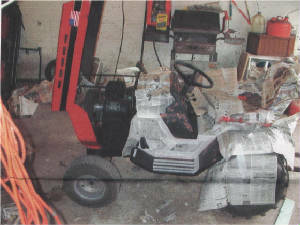 It’s a horizontal shaft, vertical piston engine and has a horizontal external starter, has a heavy duty charging system built around the flywheel-crankshaft assembly, uses a cooling fan included on that shaft, has regular valves and rocker arm, and can be rebuilt just like a car motor without having to use flimsy lawnmower parts. 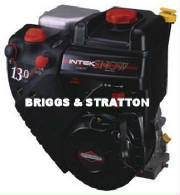 This is definitely not a lil' ol' Briggs and Stratton pull string get-a-long, believe me. You'll see from the pics that its makeup is steel-sturdy and above standard. It was made for Craftsman to their design, by Roper (later to become American Yard Products) and is heavy duty solid steel construction. The heavy lug tread design (AG standing for 'agricultural useage') of the rear tires gives it an unbelievable 'pull' and traction capability. 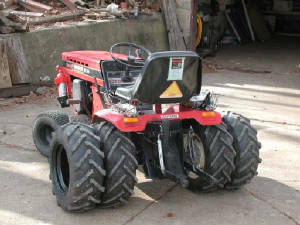 I would like to someday change the rear wheel assembly over to 'duals', not to make it look macho or anything, but strictly for the pulling power advantage while plowing. I even have two sets of tire chains for winter usage. The 42” cutting deck that came with it isn’t anywhere close to a person’s idea of some rinky-dink lawn mower. It’s a good 80lbs of dead weight, and heavy construction too. You put a dent in this, and you have to be moving a a pretty good suicidal lick when you hit that tree. It uses three 14 &1/4” blades and when engaged, pretty much stops at nothing without even straining the 114” belt drive system. Alas, no deal is perfect and I was at a loss as to why it was throwing belts. Come to find out, the ol' girl was missing a few parts from the cutting deck and . However, this is where the value of friends and pros in the form of different Sears Groups (see links below) on the Internet came into play. Through the grapevine, I was introduced to Mark Rideout (also see URL links below). Mark, with the help of his friends and the accumulation of untold hours of perseverence and patience, compiled over 700+ manuals and technical support material, on just about any Craftsman or Sears mower built. I obtained an operator's manual for the 42" cutting deck, and walla! I fabricated the missing parts and the ol' girl was up and cutting. About the only thing I had to do to it was replace some drive belts, make some turn-wrench adjustments, and tune it up after an oil change. The deck is equipped with a blade brake, and spring outfitted tension weldment that allows tension in all modes of operation other than disengaged. 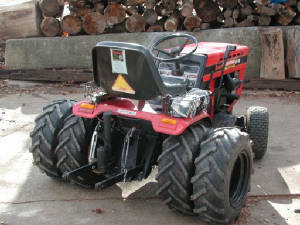 It can mow at full speed in third gear with no troubles at all. 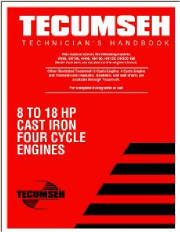 I was able to find and purchase not only a copy of the original operator’s manual, but also the 42" rotary cutting deck manual and both Tecumseh cast iron engine technician books and trouble shooting guides. 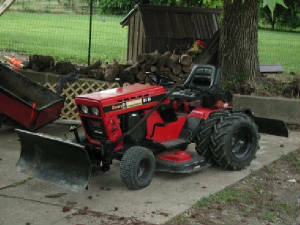 I couldn't be any more pleased in purchasing a tractor even if I had spent two-grand on a brand-spanking new Craftsman, in that she will give a couple of three more decades of supreme service and require very little maintenance. and some of older Craftsman designs. These decals below are on the back of the tractor seat. and date of manufacture (Feb of 1979). In closing, this old girl has lasted more than twenty-six years and is still going strong. The actual motor is in great shape, needing only a new carburetor which I am installing this month. I accidently snapped one of the rocker arms when trying to adjust the valves the other day, but was lucky enough to find replacement parts from Bob Gabel in Concord, North Carolina. I was amazed at his fairness and the good price he gave me. So far I have rebuilt to operational quality, the 42" cutting deck...acquired the malbro plow to turn soil to a depth of approximately 18", a 42" grader blade that fits on the electric 3-point hitch on the rear and I'm in the process of obtaining a 42" snow-blower that fits on the front if I am lucky enough . This tractor can put to good use, any and all of these attachments, and I hope to someday find a cultivator and a disc/harrow for gardening. Yep, they are really out there, and are easier to find than I can justify the ease to afford is all. 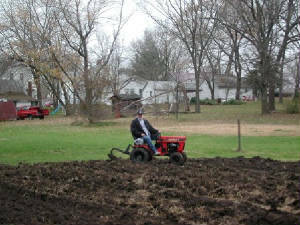 To the right here, is a good picture displaying the comfort and usability of these good old garden tractors. In December of 2005, I had to take a trip to Columbia, Missouri to have a knee operation at Missouri Medical University Hospital. The old Dodge pickup had some sore, sorry u-joints in it so I got them replaced at the local mechanic's garage. Problem was, I didn't have a way to get the drive shaft to them after I pulled it out. 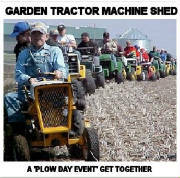 These old tractors are sturdy girls for sure, but you can use them for a ton of purposes. Here I merely tied the drive shaft on, held onto one end and made the trip to the garage with a smile on my face at the goofiness of the proposition. 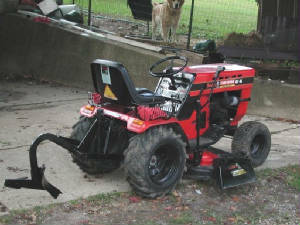 In September of 2005, I received a 42 inch "Roper Built" grader blade to add to the start of my attachment collection. Each attachment is specific for a purpose, the grader blade being multi-purpose. You can level off dirt or rock, or use it merely as a scraper blade to gather refuse and leaves into a central pile for easier removal. I have used it to level off the center hump of rock in the rear alley beside the house, and have also used it to gather loose bunches of leaves to put between the fence and back wall of the pups' shed-house out back for insulation from the wind this coming winter. It's own weight isn't but about 40 lbs but additional weights can be added to it to help deepen the 'bite' depth. A person who I had met on the group forums listed at the bottom of the page, who turned out to be a friend and great person, sent this to me. 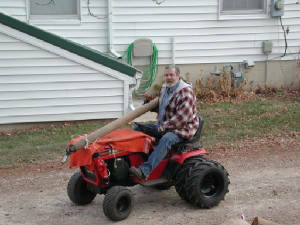 He also sent me the moaldboard plow last March or so. He is a semi-retired person who is into garden tractors for a hobby, restoration and resale when possible, and has a big heart obviously. On my limited fixed income, I would have never been able to afford these attachments for some time to come. The 3-point electric hitch makes it a very simple operation to lower and raise the blade, or any other attachment, and smooths out the ease of usage. The grader blade has a center pin that allows the blade to be turned at a 45* angle to allow material to roll off to one side or the other. They make 'center' or 'belly' grader/scraper blades, and this one I have can be turn around completely to be used as a push blade also. A normal grader blade would cost anywhere from $180.00 used to $300-$350 new. So the gift and timing what with winter coming on was huge to me. I won't have to use the snow shovel on the front walk this year hardly at all, and the parking area and front street curb-side will be clean of any cold-white stuff for sure. In June of 2006, a good freind of mine stopped by from Texas. Andy takes a yearly trip it seems, to go up north a bit and get tractor finds he comes across through the year. He had come up with a Sears 1975 or so, garden trctor with an 11 horse cast iron block single cylinder in it. Along with the deal, he had acquired a couple of front shovel blades to boot. Just as he was getting ready to leave, he sort of smiled and said "Help me get this one shovel off". I looked at him qizzically and asked him why he wanted it off? Well, thus is my new front shovel, original equipment, with frame and foo to boot, complete. 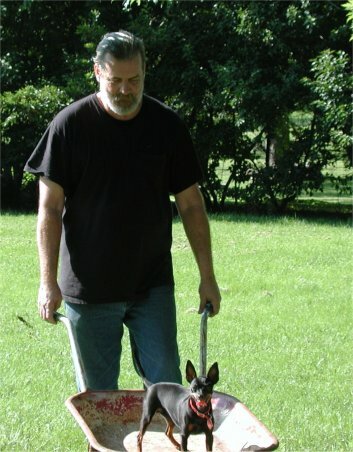 He's a heck of a guy and the additon of the shovel will put just that much more capability to the old girl for a variety of chores and tasks. These old tanks a far more versatile than alot of the newer versions of home-use tractors because back then, they knew how to build 'em and made 'em to work! So here for all to see and acknowledge, is a big, wide interenet "THANK YOU!" Andy. 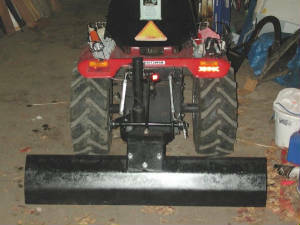 Here to the right is a rear view of the tractor with both front and back blades. The rear tires 'do' help a bit with the grab and balance, but weight is always the factor for pulling power. The whole set up isn't for any heady-duty work, but it handles small chores fairly well and is far better than a hand shovel and rake, not doubt-about-it! view of the pics for better detail. Here in the following photos, are some pics of additional 'toys' that make chores a bit easier if not just plain fun. The pic to the left and below are of the trailer which has a latch for a dump bed. This of course makes it far easier off-loading than having to dig everything back out. 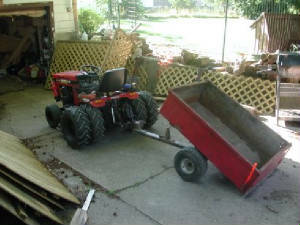 Simply pull the rear door up and set it to the side, then work the load off. 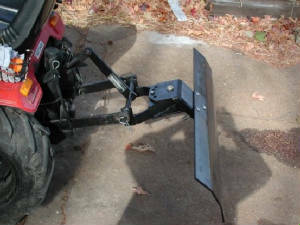 The photo below is of a home version trailer hitch. 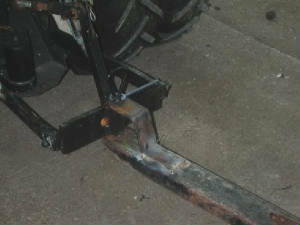 Andy in Texas made me a sleeve hitch for the 3 point on the rear, and this allows a 'quick change' for attachments on the hitch. FAMOUSE SAYING..."CAN GET IT FOR YOU TUMMORAH". 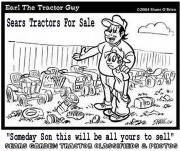 Friends that helped, advisors that advised, tractor 'gurus' that counseled and tec reps that rep'd...and an extensive list of fantastic sites for anyone wanting to repair, rebuild or maintain their own versions of garden tractors and attachments. 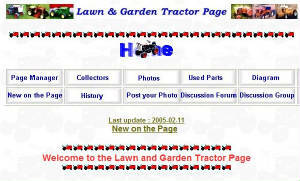 Check the links down below at the bottom of the page for quicks jumps to some fantastic group forums, specific to brand name or type of tractor knowledge. It may take a bit for the guys to get back to you through e-mail posts, but they are an accumulation of some of the best whizzes in these fields, and its all FREE! 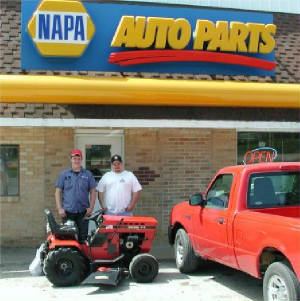 To the right is a snapshot of the 'friendly fellers' at the local Napa Auto Supply store. Chris, Jeff and Wes helped not only by finding what parts we could, but by enduring with patience as I banged my head against walls and counters at their store, and all these without them calling the local state mental hospital in the process of digging up aftermarket parts for a 27 year old tractor like this. Other places such as "Taylor's Automotive" (exhaust help) and "T & J's Small Engine Repair" (fuel system) "Andy Asberry" from Texas (malbro plow) "Bob Gabel" from North Carolina (rocker arms), "Mike Cummings" (3-point hitch actuator motor) "Garry Burgess from Illinois (additional tires and wheels for teh dualie setup) and a whole ton of tips and advice from oh so many members of several garden tractor groups (see links below). There's those folks like Joe, an owner and advisor of several groups (see links below, again), with the help of his friends like Tman- a "TPC" (lifeguard) factory representative for Tecumseh Inc., and Mark Rideout too…a technical advisor in the country sense of the word and also the site owner of http://www.sears.pammar.net where I obtained ALL of my copies of the original Sears operator's and Tecumseh engine technical manuals plus a point to remember…that they would have never succeeded in their efforts nor would these manuals have been compiled without his earnest endeavors and the help of his friends as he has noted and mentioned, unless they had succeeded in finding Noah’s Ark and the notes in the skipper’s locker room on stone tablets *smiles*…700+ strong manuals and tech books…(see links section below.) All these people were a great help. My own personal brain banger problems in restoring this old girl, such as home fabricating an exhaust system, and in just trying to find the right sites to get parts to fix the fuel system, were endeavors where success wasn't easily obtained. There seemed nowhere to be found, any new product suppliers for items such as an original muffler or a compatible fuel impulse pump till advice and help from the people listed led me down the correct pathways to what I needed and the sources to obtain these parts. So tinkering and adjusting and eyeballing to make what you needed by hand, along with making it production line quality, kept me busy for four months till it finally took shape. So special thanks to all those who took enough interest in lending a helping hand. 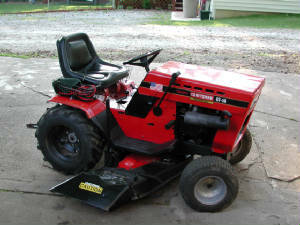 Here's a great compilation of sites that helped others like me, as I restored this good ol' girl garden tractor. 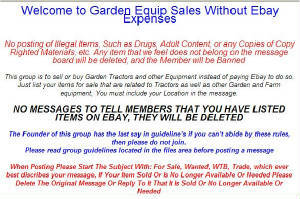 Note: To enter or access some of these groups below, you may have to become a FREE member in order to share their information, advice and archived materials.